Your spacious house has been renovated with much attention to detail and tastefully furnished and decorated. It is situated on a wild romantic area of 5000 square metres with a privat pool (450 x 120 cm), natural stone walls, old oaks and pines. It is very calm and idyllic, ideal for holidays with children, with plenty of space for playing and discovering nature. You can start your long walks and bike tours in a magnificent environment directly at your house or you can stay in your own garden in a deck chair and enjoy the smell of the herbs of Provence, listen to the sound of the cicadas and refresh yourself in the pool. The house is nice decorated in cottage style and has a dining room with open kitchen and fire place, 1 spacious room with sitting area and TV + double bed (180 cm), 2 separate sleeping rooms, bathroom with WC + separate WC. The large open kitchen in moderne style invites you to cook and enjoy the local products. Also in the autumn and in the winter time Provence is worth visiting. The wood burning fire in the dining room gives you cosy warmth. Further Details: The chalet is situated in a quiet and idyllic location, just 40 km away from the sea. Based on the very effective isolation and the thick stone walls it is comfortably cool in the summer time. An air conditioner is not necessary. In the dining room there is the chimney (with glass pane), which gives a cosy warmth at cold days. Nearby the table there is the chimney (with glass pane), which gives a cosy warmth at cold days. The house has a living-dining room with 6 places, open kitchen and direct access to the garden (private pool diameter 450 cm, height 120 cm). A fireplace (with glass pane) gives a cosy warmth in automn and winter. All rooms have electrical heating. In the spacious living room there is a double bed (180 cm) and the sitting area with TV. In the separated sleeping rooms there are double beds (180 resp. 140 cm). In the bath room there is a shower and a toilet. Separate second toilet. Susanne and Franz are incredibly friendly and welcoming, and they have thought of every detail in this spotless, stylish, charming and very comfortable property. The place has all the facilities you could want whether visiting in winter (as we did) or summer (as we wish - to take advantage of the pool, patio and BBQ), and is incredibly well stocked, on a wonderful terrain in peaceful and tranquil countryside. The grounds are immaculate (even the wood shed is neatly organised) and I wouldn't hesitate to recommend this property for a lovely and relaxing stay. This is a place that has had so much love put into it that it is tempting to keep it secret, but Susanne and Franz deserve to have their hard work appreciated. If only all holiday homes were as well-conceived as this one. You won't feel you're renting a holiday home - you'll feel like you're in someone's house if you stay here. It made our very short stay all the sweeter. Kjempe fornøyd med hus og eier. Anbefales sterkeste. Begge - for rolig helg i Lorgues med vin degustasjon eller aktiv tur i fjell (er ikke langt a kjøre til Veron område) Hus er stor, i rolig område, med stor uteplass og alt du trenger (grill, oppvaskmaskin, blender, vaskemaskin og mm) Eier snakker godt engelsk og tysk. Lo chalet è delizioso. Ordinato e pulito è arredato e decorato con gusto ed equipaggiato con tutto il necessario per sentirsi a casa propria. Perfetto sia per adulti sia per famiglie con bambini piccoli e anche per chi viaggia con il proprio cane. La proprietaria è una giovane signora molto gentile e cordiale e vogliamo ringraziarla ancora per la calorosa accoglienza e la disponibilità che ci ha riservato. Il luogo in cui si trova la casa è la felicità di chi ama la natura e desidera riposarsi all'ombra dei pini, risvegliarsi al canto degli uccelli e perdersi nel profumo del rosmarino selvatico. Dalla proprietà si possono prendere diversi sentieri per facili passeggiate nel bosco. Il paese di Lorgues è molto grazioso e vi si trovano tutti i negozi necessari per un soggiorno confortevole. Da non perdere il mercato del martedì mattina. Siamo felici di essere state le prime ospiti italiane e consigliamo lo chalet a chiunque voglia trascorrere le proprie vacanze in relax. The chalet is delicious. Orderly and clean it is furnished and decorated with taste and equipped with all the necessary to feel "at home". Perfect both for adults and for families with small children and also for those travel with a dog. The owner is a young very kind and cordial lady and we still want to thank her for the warm reception that she has reserved us. The place in which the house is found is the happiness of whom loves the nature and desires to rest to the shade of the pines, to awaken with the song of the birdies and to lose in the perfume of the wild rosemary. From the house different paths can be taken for easy walks in the wood. The country of Lorgues is very attractive and you will find all the necessary shops for a comforting stay. Not to lose the market of Tuesday morning. We are happy to have been the first Italian guests and we recommend the chalet to whoever wants to spend a relaxing vacations. We have recently returned from a month's stay in 'Le Chalet', where we were extremely warm and comfortable. The information regardiing the property on the web site is entirely accurate. The accommodation is furnished to a high standard especially the kitchen, which is very well eqipped. It was spotlessly clean and easy to keep that way. Although the owners live on site, you never feel overlooked as the garden is large and a delight, whether you are looking for peace and quiet or a childrens playground. There are plenty od walks or cycle rides to be taken directly from the property, for example one through pine woods to a vineyard and another walk (about 20 minutes) into Lorgues with beautiful views on the way. Lorgues is an attractive, very old town full of history but with plenty of shops and cafes. It also has a superb Provencal market on a Tuesday, which, even in winter was in full swing. There are plenty of interesting places to visit close by. St Tropez about 45 minutes away. The station at Les Arcs Draguignan, only 20 minutes away, has frequent trains to Marseille and Nice. It is also on the main Paris-Nice TGV high speed train line. The owners could not have been more helpful or courteous. Highly recommended. Nous avons adoré la maison, grande, magnifique et très bien équipée. Nous sommes venus avec des enfants et des chiens, il y avait suffisamment d'espace pour tous. Le terrain est immense et sécuritaire et les chiens se sont amplement amusés! L'hôte est très sympathique, présent si nous avons besoin de quoi que ce soit et très discret. Nous avons profité de la région et des randonnées à proximité, passer du temps au soleil sur la terrasse, et le soir des repas près du foyer pour se réchauffer. Les lits sont grands et confortables, nous nous sommes bien reposés, surtout avec le calme des environs. Il y a une machine à laver à notre disposition (très pratique) et une piscine pour ceux qui logent durant l'été. The picturesque small town of Lorgues in the heart of Provence is 1,6 km away from the house. There you will find many shops and restaurants. On Tuesday there is the most beautiful and biggest market in the area. 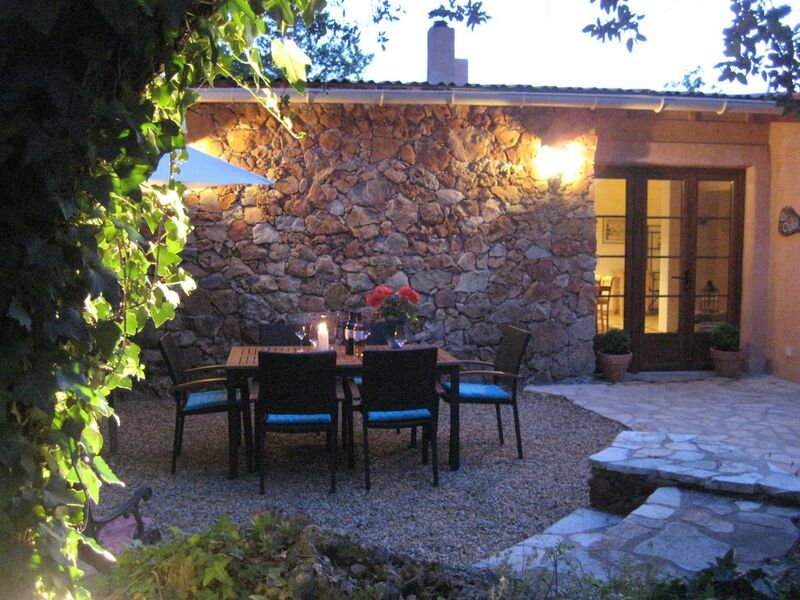 The house is the ideal starting point for eventful trips to the canyons of the Verdon or to the lake Lac de Ste. Croix (about 30 km), to the beaches near Ste. Maxime, La Croix-Valmer or Cavalaire or for a stroll in St. Tropez (about 40 km). Nice or Cannes you can also reach in about a one hour drive.